Located right next to Universal Studios in the heart of Hollywood, the Hilton Universal City Hotel provides a beautiful setting for couples wanting to host their wedding day celebrations right in the midst of some of Los Angeles’ most popular destinations. Not only can your wedding guests stay in the rooms and suites of this high-end hotel, but they are on the doorstep of fantastic sightseeing and entertainment. Despite being a public venue, the Hilton Universal City Hotel’s wedding spaces are enticingly secluded, making you feel like you have the place all to yourself. Their spacious suites feature abundant natural light and elegant furnishings, perfect for capturing candid getting ready images and details shots. You can walk down the aisle in their ornate courtyard and exchange vows beneath their romantic gazebo. The space caters to either intimate wedding celebrations or those with extended guest lists, with plenty of opportunity to personalize the ceremony with your own decorations and floral features. 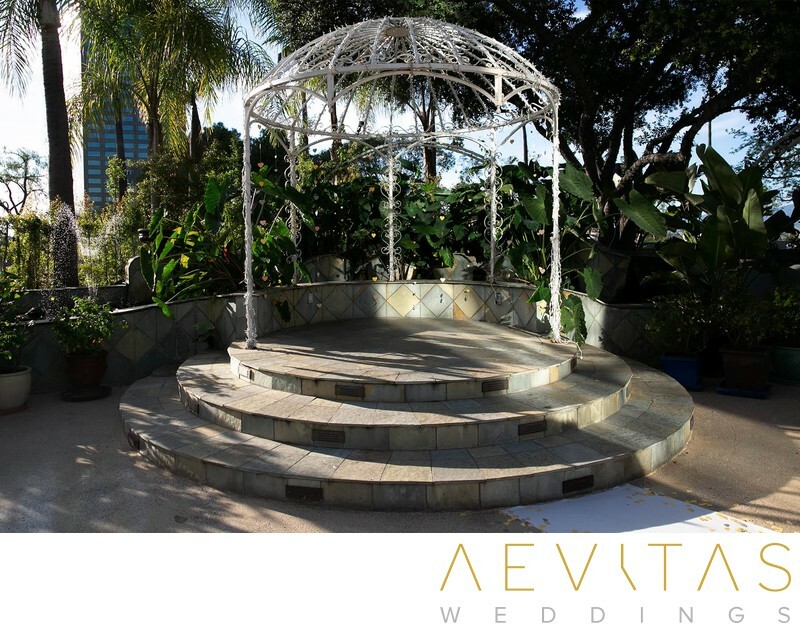 Opt to take couple portraits, bridal party portraits and family formals in the leafy garden courtyard area, or step outside and into the streets of Hollywood for a more urban wedding photo session. For couples that hold Los Angeles close to their heart and want to make a strong local statement in their wedding photos, then this setting is hard to beat. There are plenty of different event spaces where you can host your reception, no matter what you are envisioning. Create a glamorous cocktail-style event or a lavish sit-down multicultural feast, with the opportunity to customize the spaces exactly the way you want. The Hilton Universal City Hotel has a team of expert event coordinators and wedding planners to help realize your dream wedding day, with a catering team that is highly experienced in executing large scale functions. Take advantage of their exemplary customer service and intimate knowledge of the behind-the-scenes functioning of the hotel for a wedding day that runs smoothly and stress-free. If you are looking for a one-stop Los Angeles wedding venue that provides logistical ease for both you and your guests, without compromising on luxury, then the Hilton Universal City Hotel makes an idyllic choice.